Analysis: Their summit comes at a time when the Western world's faith in America's power as a counterweight to Russia has been rattled by Trump's criticism of U.S. allies. HELSINKI — A spymaster Russian president has ambitions to reclaim the glory of the Soviet empire, a penchant for tampering with the internal politics of Western democracies and a reputation for poisoning enemies. A disruptive American commander in chief elected to shake up the existing global order is confident, based on his time as an international wheeler-dealer and long-running effort to court the Russian strongman, that he'll be able to turn an adversary into an ally — or even a friend — by dint of his personal skills. And a square-jawed American prosecutor has just indicted a dozen Russian spies for interfering in the last election as part of a broader investigation into whether the U.S. president's operation — and perhaps the president himself — colluded with the Russian government to win and then covered it up. It sounds like the makings of a dime-store thriller, but a novelist would have a difficult time generating this too-real-to-be-fiction first summit between U.S. President Donald Trump and Russian President Vladimir Putin, set for 6 a.m. ET Monday. They'll sit down on technically neutral turf — the presidential palace here in Finland's continental-facing metropolitan port capital — but so clearly in the shadow of Moscow that the relatively modest government building sits beneath the towering Uspenski Cathedral, an ornate 19th-century Russian Orthodox church built when this area was part of the Russian empire. Their discussions, one of which will be held one-on-one, come at a time when the Western world's faith in America's power as a counterweight to Russia has been rattled by Trump's harsh criticism of allies, his laissez-faire approach to Putin's annexation of Crimea and election-meddling, and his implicit and explicit threats to abandon the trans-Atlantic alliance that has checked Moscow's power since the end of World War II. "After spending the week trashing allies — from [German Chancellor Angela] Merkel to NATO to [British Prime Minister Theresa] May — it will be even more jarring if Trump's meeting with Putin is another lovefest with an adversary," said Laura Rosenberger, a foreign policy adviser on Hillary Clinton's presidential campaign who is now a senior fellow at the German Marshall Fund. For years, Trump has spoken admiringly of Putin — "a leader far more than our president," he said in reference to Barack Obama in 2016 — and played down criticism of Putin's murderous tendencies, territorial expansion and campaigns to influence foreign elections. His critics worry that he is too concerned with winning Putin's affection and invested too little in American interests, as defined by past presidents and a bipartisan consensus in Washington that Russia is a growing threat to the U.S. and its allies. On Friday, Trump said he planned to discuss with Putin some of the very issues that NATO partners raised with him during a two-day summit in Brussels earlier this week. Trump roiled those talks by demanding European countries put more money into their own defense and suggesting he could not only pull out of the alliance but withdraw U.S. forces from Europe that provide a deterrent to Russian aggression. "There is a benefit — there is a psychological and a military benefit," Trump said of having American troops stationed in Europe. "There is also a benefit not to do it. It wasn’t a threat I made, it’s just an unfair situation." And yet he proclaimed the meetings a success in terms of unifying NATO partners in advance of the Putin summit. "We go in strong," he said. Specifically, he said his agenda with Putin includes many of the issues about which NATO countries are most worried. "We will talk about a number of things: Ukraine, Syria, the Middle East, nuclear proliferation," Trump said. "We are massively modernizing and fixing and buying and it’s just a devastating technology. It is a very bad policy. We have no choice. We are massively big and they are very big and I’ll be talking about nuclear proliferation. I will absolutely bring up meddling. Hopefully we will have a very good relationship with Russia, China and other countries." But Trump did not elaborate on how he would like to see those items resolved. Moreover, he often seems to be at odds with members of his own administration about the definition of American foreign policy interests, particularly when it comes to Russia's actions serving his preferred outcome. For example, in a briefing with reporters before the trip, U.S. Ambassador to Russia Jon Huntsman identified Russian influence in the British vote to exit the European Union and the American presidential election as areas where Putin should be repudiated. "You need to go in with eyes wide open," Huntsman said. "And you need to make sure that we're willing, on our side, to hold Russia responsible for the many activities that they are responsible for, whether that is election meddling; malign activities throughout Europe, including the Balkans, UK and Brexit, France, and Italy, just to mention a few; and to hold them responsible for this new form of warfare — hybrid warfare that we have seen most recently." It is the nuclear-nonproliferation angle that Europe will be watching closely. 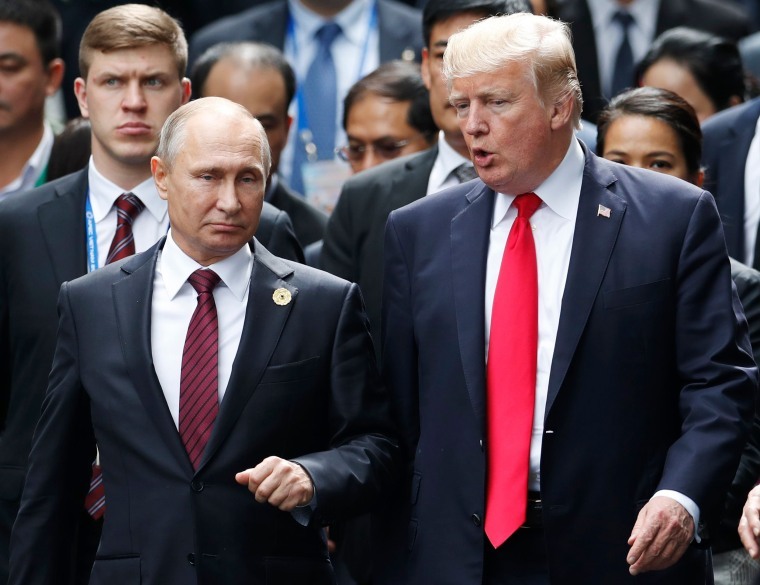 "There are some positive aspects for both of presidents and their nations as well for the whole world in the summit," said Markku Kangaspuro, director of the University of Helsinki's Aleksanteri Institute, which studies Russia and Eastern Europe. "The first one is that there is demanding need for dialogue between the two big nuclear weapon powers, USA and Russia." "Relations between them are already now so bad that it starts to be dangerous for all of us if the development continues to this direction," he said. Putin is eager to normalize relations with the U.S., which does relatively little trade with Russia and has levied painful sanctions on Putin government officials and associates over Russia's incursions into Ukraine and its cyberattacks against the U.S.
Putin has been hard at work in recent years trying to rebuild Russian strength, which is helped in part by the perception created by relatively low-cost tampering with elections not only in the U.S. but in the western Balkans and across Europe. In March, he announced the development of a series of new missile systems, a response he says to the destabilizing effect of the 2002 U.S. withdrawal from the Anti-Ballistic Missile Treaty and subsequent American development of missile-defense technology. "All the systems I mentioned today easily overcome missile defense," Putin told NBC's Megyn Kelly. "Each one of them. This is the point of all these developments." Putin has said that it is his goal to join forces with the U.S. to provide greater security and stability for the world, but he has done so even as he has executed physical and technological attacks on other countries that fall short of triggering a military response from the U.S. and NATO. James Collins, the former U.S. ambassador to the Russian Federation, said there's a chance the summit could start to change the trajectory of relations between the countries if the leaders push their bureaucracies to work with each other, move toward cooperating on arms control, and signal to their private sectors, universities and other institutions that the other side isn't the enemy. If Putin were to show real interest in re-engaging in those ways, Collins said, "it would be a very significant step." Three days before the summit, Deputy Attorney General Rod Rosenstein announced that Mueller had secured indictments against Russian spies accused of hacking into email accounts used by Democratic Party organizations and associates of Clinton and disseminating material to harm Clinton's chances of winning. According to the Justice Department, the spies first tried to hack into accounts used by Clinton's personal office "after hours" on the same day, July 27, 2016, that Trump publicly encouraged Russia to produce emails sent and received by Clinton when she was secretary of state. The indictments dramatically heightened tension over the summit in Washington, with top Democrats calling for Trump to back out, and threatened to cast a pall of suspicion over the private meeting between Trump and Putin. The Russian foreign ministry accused Mueller of trying to undermine the summit. "Now influential political forces in the United States, which are against normalization of relations between our countries and for two years have been indulging in vilifying Russia, are trying to get the most out of yet another fake matter that will be forgotten very soon," the foreign ministry said in a statement parroting Trump's charge that a "rigged witch hunt" is being conducted to discredit him. "We have only one question: how long are they going to keep on making this shameful fuss that discredits the United States?" the ministry said. "Sooner or later, its initiators will have to take responsibility for the damage they have done and continue to do, in their selfish interests, to American democracy." Trump said Friday that he would tell Russia to stop interfering in elections — and officials in his administration have repeatedly said Moscow's efforts to destabilize the U.S. are ongoing — but he also has said as recently as last month that that he trusts Putin's denials. "He said he didn’t meddle," Trump said at a press conference in Singapore following his summit with North Korean leader Kim Jong Un. "I really believe that when he tells me that, he means it."